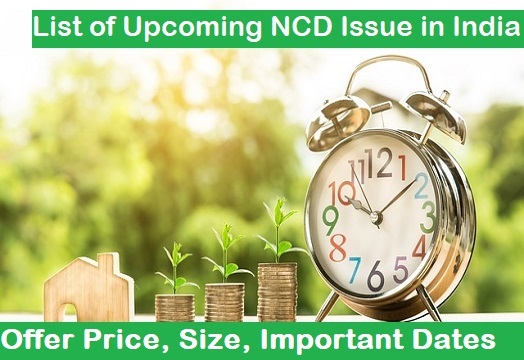 Upcoming NCD 2019, List of Upcoming NCD issue in 2019, NCD Offer Price, Size, Important Dates & How to Apply online? NCD issue signify Nonconvertible debentures public issue. If you are in search for the latest upcoming NCD 2019 India then you are at the right place. Today’s our topic of discussion is centered on Best NCD to invest in 2019. Read us till the end to learn about the forthcoming NCD Debenture. An NCD is the fixed income debt issued by a company to raise money from the capital market. Unlike the equity shares, the bondholders do not have any ownership rights in the company. It is aptly true that these NCDs are worth investing if the issuer has got credible ratings by the rating agencies. NCDs are listed on the stock exchanges like BSE & NSE in India. When a buyer purchases corporate bonds, one lends money to the company. In exchange, the company promises to return the money on a specified maturity date along with the stated rate of interest. corporate bonds are debt securities. They are considered as long term investment options. the maturity period of such securities ranges from 1 year to 20 years. Investors apply for the NCDs through the brokers. Based on the subscription they receive the number of NCD shares. The NCDs are credited to the demat account and the money gets deducted from the trading/bank account. The NCD Issue Procedure is similar to the IPO process. NCD issue full form-Non Convertible Debentures public issue. They are corporate bonds with fixed interest and tenures. NCD’s are similar to bank fixed deposit. NCD public issue is similar to the IPOs. An investor can hold NCD in the Demat account as well as the paper certificates. Q. Is it good to invest in NCD? Q. Why you should consider investing in NCD? In the current scenario, NCDs’ are considered worth investing reason, if the issuer has got a good rating from the rating agencies, offering higher interest rates compared to fixed deposits or other term deposits in the market and can be liquidated at any point of time. Q. How do I apply for NCD online? As you all know that companies will commence the issue of NCD for a specified period of time. After that these NCD are listed on the stock exchange. Online brokers like ICICI Direct, Edelwise, Sharekhan allow you to apply for NCD. Applying for them online is indeed convenient, and will probably be the first choice for most people. However, there is no guarantee that every online broker will have the option available right on day 1, and in case the bonds are being allotted on the basis of first come – first serve, this will make the difference in case of oversubscription. If you are interested in applying them online then keep an eye on your broker’s website to see the announcement for availability of these bonds, and check that frequently. Login to you share broker site OR Net banking with your User ID & password. On Apply Debenture page, click on “ASBA” radio button. Submit with all required details. Dear investors, the rate of interest that you will earn on NCD is taxable. As there is no tax deducted at source (TDS) deduction in NCDs, on sale or maturity the amount of return (if any) gets combined in the income of the investor as “income from other sources” and taxed at the applicable income tax rate. First is the interest income from an NCD and tax treatment is exactly same to any other interest income such as interest income from FDs. In other words, interest income from NCDs will be subjected to tax at normal rates by including it in ‘Income from other sources’. Next is capital gains. I hope that above-provided information on “Upcoming NCD in 2019″ is of great assistance. If you like please share it among others via facebook and twitter. Also, write to us, in case of any suggestion pertaining to the post. We will extend you every possible help. You can reach us through the comment section mentioned below. Last, but not the lease please don’t forget to like and subscribe us. Thanks for reading & have a wonderful day.